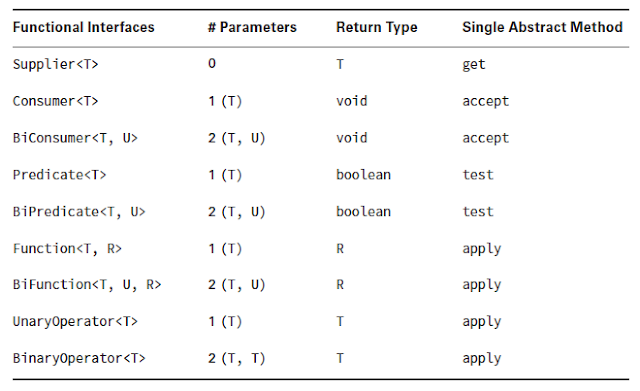 In this post we will see method references, a new feature introduced in Java 8. This is again closely related to Lambda expression. So before you proceed with this post kindly revise above posts on Lambda expressions and make sure you are comfortable using those. As you can see we have used reference to static method sort of class Collections. Here we have used Consumer functional interface that takes a single argument and return type is void. Here we have used Supplier functional interface whose job is to return a given object type (it does not take any argument). In this case it returns our new ArrayList object. Here we have used a Predicate functional interface that take single argument of a type and returns boolean. This may look similar to static method reference but it is not. isEmpty() is not a static but an instance method in String class. Here again we have used Predicate functional interface but notice how here we are using reference of a method in a particular instance rather than a class. NOTE : One thing that is commonn to all method references is deferred execution just like Lambdas. They are just references ready to be executed at a later point in runtime. I had a word document already saved in my dropbox which was initially created on windows I think. When I moved to mac I could open the same document in mac word with links working just fine. Now I edited the doc and exported it as PDF. On opening the PDF I realized the links do not work though it gets displayed a hyperlink in the PDF. After bit of poking around I found out it is an known issue. In this post I provide an alternative approach that worked for me. Open pages app in your mac and open your word doc in it. Verify all links are working. If you need to edit you can edit it here. Next reopen this pages document and go to File -> Export to -> PDF and save it as PDF. Links should work now. Sometime back I had written a post on MongoDB. Installation and basic syntax in Windows - Getting Started with MongoDB . This post is starting of series of posts on MongoDB. In this post we will see installation and configuration of MongoDB in Mac. 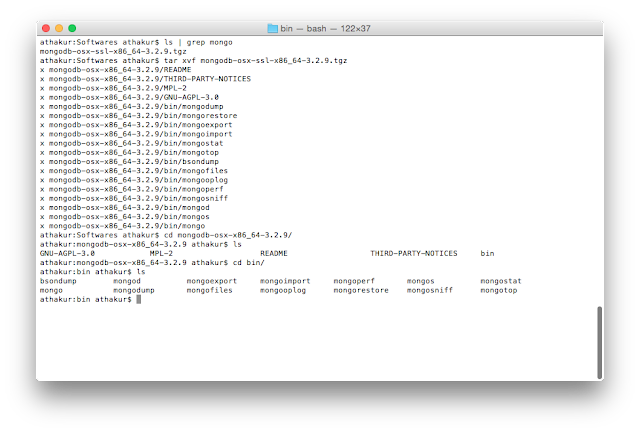 Go to MongoDb download center and download the tgz of the latest build. Your OS should already be selected and you should see the download link. mongo : This is the mongo shell used to connect to the mongo DB. mongod : This is the actual server. 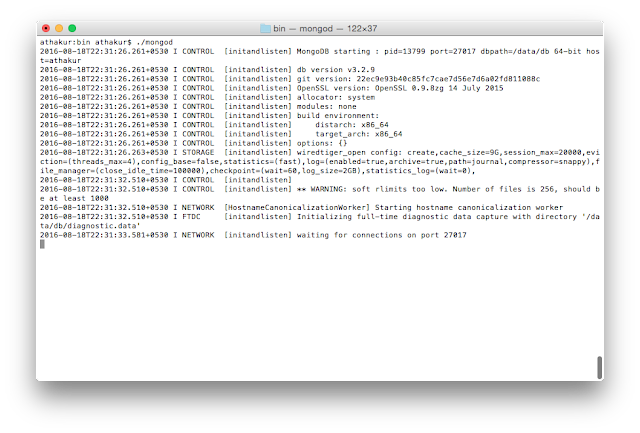 That's it your mongo db is installed and ready to be run. 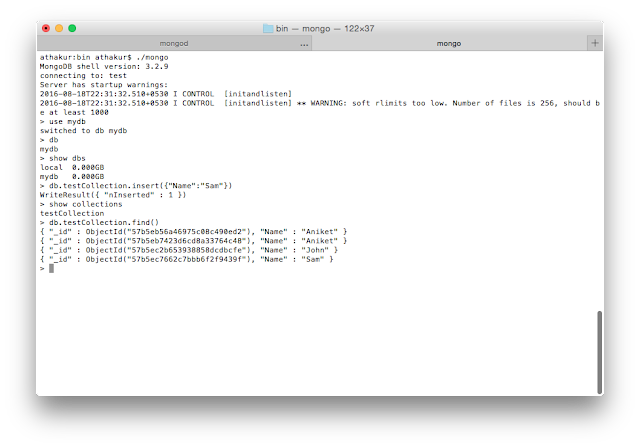 NOTE : MongoDB by default stores its data in directory "/data/db". So make sure this directory is created with necessary permissions. 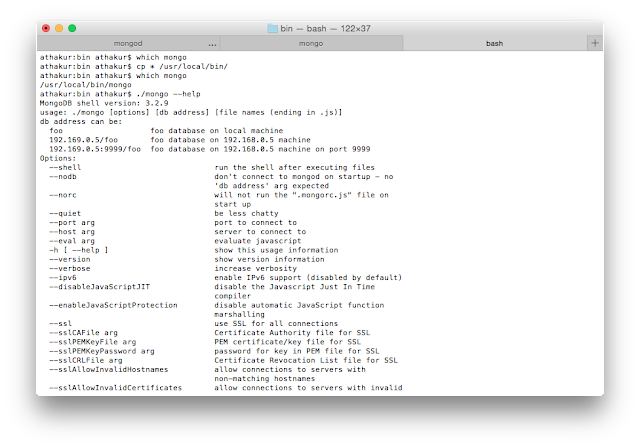 --dbpath arg directory for datafiles - defaults to "/data/db"
To run MongoDB server go to bin directory and start mongod program. This should start your mongodb server listening on default port 27017. Once mongodb is up you can try connecting to it using mongo shell.